SWSI is a new media platform that creates original programming to help promote female entrepreneurs of product companies, enabling them to get known, get funded and go big! Their first property is Queen Bee, an online reality competition that combines mentoring, crowdfunding and commerce to launch the next big brands targeting women. It’s not about whether or not you’ll be eaten by the sharks: it’s about providing mentorship and exposure to prepare an entrepreneur to be able to navigate shark waters, if necessary. To go one better, through crowdfunding, viewers vote, support entrepreneurs and pre-order products. Founders Marci Weisler, Heidi Lehmann and Suzette Cabildo all have deep backgrounds in the New York startup scene. Here’s their plan to help level the playing field. Queen Bee is a new reality competition for female founders of product companies that lets them get known, get funded and go big. Queen Bee combines business challenges with mentorship of our established judges, with crowdfunding. There have been other shows with pieces of this, but not the whole package. We want this to be an opportunity for participants to walk away with great insights that they can use to build their businesses. Additionally, while only one contestant will be crowned QUEEN BEE, all launch crowdfunding campaigns (with Indiegogo), and the exposure from the show will help drive contributions. Because the show launched digitally on-demand at ora.tv/queenbee, the crowdfunding and commerce are right there and it makes for a seamless experience. Both female founders and product companies have a tougher time getting funded since they don’t fit the typical VC model, so this show helps participants get to the next level. There’s a huge opportunity! Women control 85% of purchasing power and there’s room for great new brands. We want to find the next Tory Burch, the next Skinnygirl, the next Spanx. With the show, we’re focused on media dollars, but have plans to diversify revenue sources. How many segments are you planning on doing? There will be three or four episodes in the first pilot season of Queen Bee and we are in the planning of subsequent seasons. What is the biggest product category that you’ve seen, so far? We are focused on food, fashion and fitness. 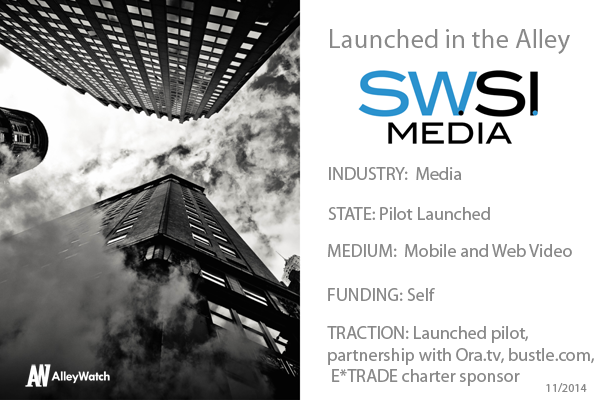 We crowdfunded seed money, got E*TRADE on board as a sponsor, partnered with Ora Media (Larry King and Carlos Slim’s digital media platform) and launched the show. We will come out even bigger over the coming months. Because the three of us have been immersed in the NYC startup scene, we’re familiar with the usual suspects in the tech investor community. Given that we’re focused on media and women, we’re really looking for under the radar investors who look at the big picture around media, product businesses and also want to be a force in changing the ratio in terms of women leaders and founders in business. The three of us have built our careers in NY digital media and think there’s lots of opportunity here–both in terms of production and media/advertisers, but it’s also become a hotbed of entrepreneurship. We have found so many interested participants in many different verticals. What’s your favorite NY spot that makes you feel like a queen bee? Marci Weisler: My favorite neighborhood restaurant, which always holds a table when I ask, has a glass of wine waiting and keeps it full…on the house! Heidi Lehmann: Bull and the Bear at the Waldorf Astoria for a dirty martini. Best pour in town and great old school ambiance. Suzette Cabildo: Central Park. I can buzz throughout the park and feel like I own the place.